Going solar can be expensive, so be sure to get the best solar panels for your home electricity needs. With so many manufacturers to choose from, it can be daunting to find the best solar panels for home use. What brands are best? Do more expensive solar panels work better? How do you decide? In a nutshell, the best panels for you are the ones that best balance efficiency, reputation, and cost. Let’s run through all the factors to consider. Do I Need to Buy Expensive Premium Panels? Oftentimes, this is the first question on homeowners’ minds when deciding what panels to purchase. Here’s the simple answer: no! Budget option – These budget solar panels are low cost, with quality not quite on par with other well-known brands. In the solar world, you’ll often find these options on Amazon. These companies typically don’t have a strong web presence and it can be difficult to find any useful information on their products. Unless you’re building a small, off-grid system for your RV and are only risking a small amount of money, stay away from these! Standard option – These are the brands everyone knows, like Toyota and Honda. In the solar world, popular companies manufacturing standard panels include Trina Solar, Yingli, Canadian Solar, and Hanwha. These solar panels provide consistent energy production, decent warranties (usually 12 years for parts, 25 years for production), and competitive prices. 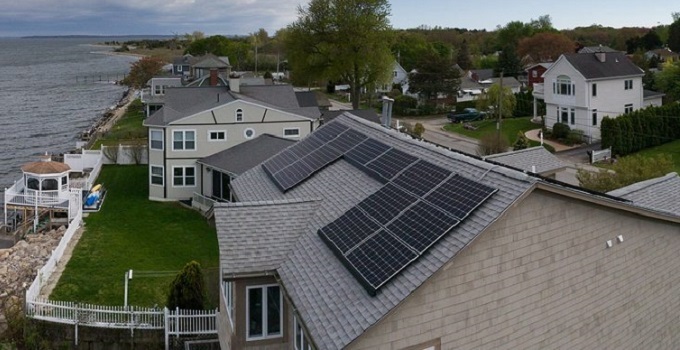 The vast majority of panels we see on rooftops across the US fall under the ‘standard’ option. Premium option – These are the cars your CEO drives: Lexus, Mercedes, and BMW. High-quality, high-cost. They are absolutely not necessary, but certainly come with perks. Premium solar panels like Sunpower and Panasonic offer higher production, longer warranties, and/or beefier components, but at a significantly higher cost – 2x as much or more than standard panels! For the vast majority of us, purchasing and installing ‘standard’ quality panels will work perfectly. Yes, premium panels produce more energy and, yes, their warranties are longer, but the benefits rarely outweigh the additional cost. When roof space is an issue and you can’t install as many solar panels as you’d like, most homeowners simply decide to install fewer panels and deal with the lower production rather than upgrade to premium panels. In the end, it typically works out better financially. What’s the Best Solar Panel Efficiency? To make installing on homes easier, residential solar panels all generally fall around 3 feet wide by 5 feet long (maybe an inch or two difference between different manufacturers). Solar panels designed for big, open commercial buildings are physically bigger, but what installer wants to carry a giant panel with one hand up a ladder onto a home’s slanted roof? As a former installer myself, not me! Instead of physical size, the difference among residential solar panels is their efficiency, and by extension, wattage. The more efficient a solar panel is (that is, the percentage of sunlight that hits the panel which it can turn into usable electricity), the higher its wattage. The higher the wattage, the more electricity it will produce. Premium solar panels like we discussed above, beyond longer warranties and other benefits, also typically see higher wattage due to their ‘premium’ components (like ultra-pure monocrystalline silicon). You might be thinking that you should just buy the most efficient solar panels you can afford, but in reality that’s not always the smartest way to go about it. Like we said, higher efficiency equals higher cost, but the two do not increase equally. The price is usually simply too high to justify the increased production. Residential panels typically fall between around 260 watts to 320 watts, with the majority around 270 watts. Most rooftops have ample space for solar, and 270 watt panels are efficient enough for the majority of homeowners – providing the perfect balance of energy production and cost. So you’d need 4 less panels if you were to install ultra-efficient 320 watt panels instead of standard 270 watt panels. So which ones are the best solar panels for home use? Like we said, it depends on cost. If all panels across the world cost the same amount of money, of course! However, higher efficiency panels command higher prices. Let’s take a look at what panels cost, and what you should spend on your solar panels. Each of these companies produces millions of solar panels each year, and back up their products with decent warranties and good reviews. They keep costs low by producing huge amounts of product and having razor-thin margins. If you work with a national solar installer, chances are your installation will include panels from one of the companies above, or a company producing very similar products. Some smaller installers exclusively install premium solar panels from companies like Sunpower. While these panels and their superlatives (Best in the world, most efficient on the market, etc) certainly are enticing, be sure to keep a level head and be absolutely positive that the additional electricity production you’ll see outweighs the additional price of the solar panels themselves. The best way to find out which panels companies are installing in your area is simply by talking to them. No matter the size of their business, all installers will happily come to your home and give you a free estimate tailored to your house. Reach out to a few and discuss what solar panels they recommend installing. Keep in mind that these are average costs. If you’re installing premium panels, your total panel costs will be much higher. That should come as no surprise – it’s the way the world works. Even still, this gives you a basis of what to expect. If you’re spending more than $175 per panel for your installation, it certainly raises some red flags. Ask your installer why the panels cost more than the typical installation. Are they a premium option? If so, ask how they’re different and how long it will take to recoup this additional investment through energy savings. If they’re not a premium option and your installer can’t provide a good answer as to why they’re more expensive, it might be time to look for another installer! Any Special Considerations for Intense Weather? You might be wondering what are the best solar panels for homes in extreme climates. 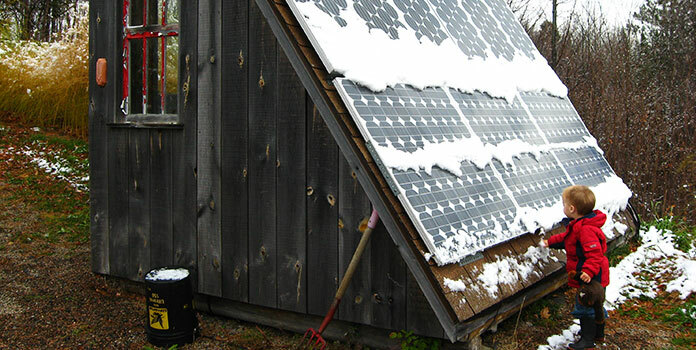 Intense weather like heavy snow or strong winds is certainly a concern for solar installations. Companies like Canadian Solar made a name for themselves by producing extra beefy panels that could withstand extreme conditions. Beyond snow load, manufacturers also measure wind load to ensure your solar panels don’t fly off your roof in a storm. As you can see, the ‘premium’ Sunpower panels are rated the exact same as the ‘standard’ Trina panels. As expected, Canadian Solar panels actually see higher durability than both of them, so if you live in an area with long, extreme winters, it certainly pays to read over your solar panels’ spec sheets! For the vast majority of us, the best solar panels for our homes are just the standard options. By this we mean standard panels from well-known brands like Trina, Yingli, Hanwha, and Canadian Solar. If you want a reliable system that’ll save you money, these are a great bet. When you think about it, there’s a reason these companies are popular. They’re efficient, cost-effective, durable, and work great in almost all situations. Buying premium panels is like buying a muscle car: overbuilt and certainly more than you need, but fun to have. If you go this route, do your homework to make sure they’re worth the high cost. If you’ve got plenty of roof space, chances are these panels just aren’t worth the higher price. Do you agree with our assessment? Let us know your own thoughts in the comments below!